Calling all quiz whizzes! Waterford Healing Arts Trust invites you to test your knowledge at a fun Quiz Night at The Cove Bar, Dunmore Road on Thursday 27 September at 8.30pm. Entry fee is €20 per table of 4, with all proceeds going to Waterford Healing Arts Trust. All welcome. Further details from Waterford Healing Arts Trust (051) 842664. 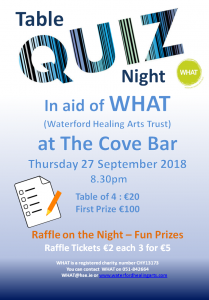 Announcing details of the event, Shirley O’Shea, from the Fundraising Committee of Waterford Healing Arts Trust (WHAT), said “This is the third year to have our Quiz Night at The Cove Bar. After our previous successes, we’re gearing up for a great night again this year, with lots of prizes, including €100 for the winning team. It’s not too serious: You don’t have to be on Mastermind to take part, so why not get your pals together and come and join us for an enjoyable social evening and help us raise funds for this great cause. Waterford Healing Arts Trust runs a wide range of arts programmes at University Hospital Waterford which contribute to the health and wellbeing of patients and their families. We’re fortunate to have this wonderful organisation here in Waterford, so let’s do all we can to support them. Our sincere thanks to all the team at The Cove Bar for their invaluable support”. Tom Drohan, Manager of The Cove Bar, added “We’re delighted to host this fun quiz night in aid of Waterford Healing Arts Trust. We all know the great work that WHAT does for the people of Waterford, so we’re looking forward to welcoming a big crowd and raising funds for this cause that’s close to all our hearts”.